"CO2 is indeed a greenhouse gas..."
Yes, if you quadruple the concentration of CO2 in an airtight greenhouse, it costs slightly less to heat it. However, planet Earth is not a greenhouse. It has no glass roof and walls separating inside from outside. Any solar photon that strikes a CO2 molecule and warms the air is ONE LESS photon to strike and warm the surface. Net heat is the same whether a solar photon strikes a lower atmosphere air molecule, a water molecule, or the surface. The entire greenhouse theory of Earth warming is a crock. Heard an interview on NPR recently where an engineer from the Army Corps of Engineers repeatably made the point that areas protected by CoE seawalls or barrier dunes had NO damage. He also spoke of several communities where seawalls or barrier dunes were recommended and would have been built by the CoE but the locals launch vociferous campaigns to stop the construction to "preserve our beaches". These communities suffered grievous damage. And now we are expected to bail these clowns out. So a blanket can't warm you because the escaping heat from your body escaped into the blanket making you colder. We have been told that CO2 follows warmth, not the other way around. It is indeed very likely that the complexity of the miracle that is our atmosphere is not well understood. Moisture suspended in the air, cloud cover influenced by cosmic rays from the sun, sun spot activity and our air purifying oceans that absorb CO2 and even convert some of it to limestone - all these things and more that I don't comprehend - are keeping us relatively comfortable. Long term, it is warming, but we have to understand that we cannot now nor will we ever control the earth's climate. I go with Michael Crichton on this one: "You think man can destroy the planet? What intoxicating vanity." my attitude has been to understand realize that models do have flaws and the science itself is still in flux but like Hurricane models have flaws and the science of hurricanes is still evolving - we do not deny the existence of hurricanes and we do realize that if one is predicted, it often does appear and it can cause even more damage than predicted, as well as less. But we do not deny the hurricane or it's potential to cause harm because the models are flawed and we still have disagreement about how they actually work. it just makes sense to NOT be a skeptic on the EXISTENCE of something just because the models are flawed or the science is not complete. We do, in fact, waste millions of dollars evacuating from an area thought to be hit and it does not happen. But how many people say that because the hurricane did not hit that it proves the scientists are engaging in a conspiracy to fool people or perhaps that the scientists will somehow benefit from false evacuations? If this sounds silly, I agree but it's sill for both hurricanes and global warming. they are both real even if we don't know every nook and cranny about how they work or how severe they might be. balmy ≈+15°C that it is. Chief among climate scientists critical of the high-sensitivity holdouts is James Annan, an experienced climate modeler based in Japan who contributed to the 2007 science report from the Intergovernmental Panel on Climate Change. By 2006, he was already diverging from his colleagues a bit. While Annan believes the evidence now allows for rejection of very high numbers for climate sensitivity, he still believes it is at a dangerously high level of 2.5-3.0°C. I see a moral hazard in there somewhere? Climate change or not, it seems to me that markets were distorted by the implied and explicit "insurance" provided by government for people who live along these coastlines. Bloomberg claims that for years he's been "predicting" that climate change might cause a disaster like this. However, it seems his NYC disaster prevention expenditure for 10+ was minimal vs the damage done vs "social" expenditures. Yet, he is one of the first in line calling for State and Federal funds, to "recover" (including building protective infrastructure). Moral hazard, or ponzi scheme? to insure with private insurance. The insurance companies are speaking volumes about future risk and they, unlike the "deniers" are not gambling. They want cash on the barrel head if they are going to insure homes in newly-defined flood areas. FEMA and Army Corps have more than doubled the area of likely flooding in NY/NJ since Sandy. Your analogy is not a good one as we know that hurricanes exist as well as much about how they grow and die. We know little about the total life cycle effects of CO2 in the atmosphere. A more apt analogy would be that someone predicted that hurricanes were going to continue growing uncontrollably once they hit land and so we should evacuate Kansas the next time one headed for the Texas coast. We don't do this because it runs counter to our real life experience just as the basic theory underlying dramatic predictions of climate change ruin to come runs counter to our experience that complex natural systems do not suddenly go wildly out of balance due to minor changes but are, instead, remarkably stable. Slowly, slowly the air will be allowed to leak from the balloon of AGW alarmism as reality intrudes. The many who disparaged all who doubted the theory will never apologize, the trillions being spent on useless attempts to mitigate a non existent problem will never be admitted and the millions of poor who have been starved to death by the policies directly resulting from such fanaticism will never be acknowledged. Life will go on but we will largely learn nothing from this decades long debacle. we know more about hurricanes than we used to but even now when a hurricane occurs, you can see a dozen or more different model tracks. re: Kansas - ... re: Sandy... have you noticed as of late the much more extensive damage that we are seeing ... and the wider evacuation areas as well as the virtual abandonment of some of those areas by the insurance industry? FEMA just re-drew the flood maps of NY/NJ and the new ones show twice as much area susceptible to flooding from expected sea level rise. Now they do not know just how much it will rise but they are pretty sure it's not zero. So what do you do? do you seriously underestimate it so that the next Sandy floods much more than thought or do you start thinking in terms of probable higher sea levels and the likely damage that will result if and when storms hit? what do you gamble on? Worse, once AGW has died away, a brand-new catastrophe will be ginned up, and there will be calls for urgent action to prevent planetary collapse. These are simply crises generated for the sole purpose of controlling other people (and their money). no kidding, and of course subsidized government insurance in flood zones and free money from FEMA grants keeps people in flood zones, when they should be building dikes, or moving elsewhere. But this has been happening long before the global warming became a hot issue. Government has been doing this at least since the very cold 1970's and insurance companies have been refusing to insure at least as long. Not to beat on the dead horse here. but CO2 can only absorb certain wavelengths of light. Those that come from the sun are not in the range as often as wavelengths that come from the earth. Also note that different molecules do absorb different wavelengths of light. CO2 and H2O have similar profiles for absorption. no.. the areas that are expect flood are increasing in size by large amounts... land that never before was classified as flood prone. Whatever the master tells you, you repeat. Good job, you win 1000 sycophant points today. the flood maps determine the type and extent of subsidized flood insurance as well as the price of private insurance. There's a lot of apples and oranges involved in this. 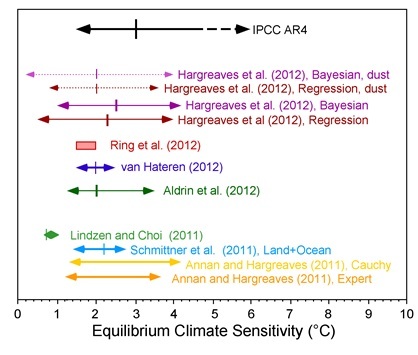 Any geological record of climate sensitivity is working on a much different timescale than anthropogenic CO2 release. It's like comparing bread cooked in an oven and bread cooked by the Hiroshima blast. A lot of feedbacks work at the scale of 100's to 1000's of years (ocean temperature, sea floor temperature, heat conduction through permafrost, glacial retreat, etc.). If you are only worried about the year 2050 you ignore them. If you're looking at the last 50 years you ignore them. If you're looking at the year 2500, they're relevant. So when you through all this up there that scientists disagree you really have to pin down exactly what they're talking about. There will always be uncertainty but the discussion becomes meaningless if you aren't talking about the same thing.